Bitter Freedom tells the remarkable story of a Jewish family's survival under Nazi occupation in Poland with the help of a heroic Polish mechanic named Jozef Zworanz. 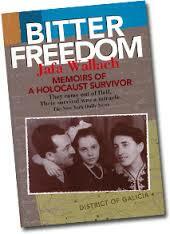 Come hear Rena Wallach Bernestein recount the story of freedom. The summer exodus into the Catskill Mountains overflows with thousands of Jewish bungalows, hundreds of camps, with Synagogues and Yeshivot galore. The main streets of otherwise sleepy towns suddenly sprout Kosher delis, pizza shops and Jewish book and novelty stores, teeming with shoppers and strollers like a transplanted Boro Park. After a while, some may feel they need a vacation from the Catskills. Here's an interesting alternative: Instead of turning west on Route 17, head north on interstate 87, which will get you to Albany's New York State Capital within 2 hours. The impressive Capital buildings and the New York State Museum are worth touring. Cooperstown's Baseball Hall of Fame and the subterranean Howe Caverns are 20-50 miles west. Tannersville has a Shul, day camp, mikvah, and the Torah Learning Institute (www.machonchana.org.) offers classes for women of all ages and stages in a 60-room hotel. A little south, Hunter and Windham draw ski buffs to their intense slopes. Summertime visitors enjoy the countryside, farms and meadows, and the rugged mountain vistas and wildlife. The picturesque towns beckon with inns, country stores and art galleries. The town of Woodstock continues its legend with artsy boutiques displaying unique items. Great vacation opportunities lie further north in the pristine Adirondack mountains, with cascading waterfalls, hiking trails winding up to panoramic vistas, quaint towns and artist colonies. A vacationer's paradise, Lake George is filled with outdoor sports andamusement. The grand sparkling lake is surrounded by majestic mountains, hotels, motels and B&Bs. It satisfies the needs of the elderly who prefer nature's quiet beauty, and of youth seeking adventure with hot air balloon rides through breathtaking valleys. The Great Escape and Splashwater Kingdom is Upstate's largest six theme park. Adirondack activities include whitewater rafting, kayaking, natural stone bridges and cave spelunking, horseback rides, cruise ships, mountain biking, skiing, fishing, carriage rides, golf, wax museums, arcades and historic museums. Northwest is Lake Placid, site of the Winter Olympics. Saratoga hosts the famous Race Track, and aficionados will enjoy the new National Museum of Racing and Hall of Fame, as well as the historic Casino in blooming Congress Park. The Saratoga Performing Arts Center is the summer home of the Philadelphia Symphony Orchestra. Over 100 naturally carbonated mineral springs burble in elaborate fountains throughout Saratoga. No charge. The therapeutic Lincoln Mineral Baths also attract elderly Chasidim who maintain a Shtiebel in July. Saratoga National Historical Park, the battlefield where the Americans halted the 1777 British invasion has Revolutionary War cannons, period uniforms and artifacts. Downtown Saratoga features magnificent Victorian mansions, and Yaddo is a 400-acre artistic retreat nearby. Saratogarecently received the Great American Award for using its past to draw visitors today, and its Jewish community is seeing a revival. The Capital Region has an active year round Jewish community, with shuls and 5 Chabad Centers, 2 Mikvaot and Kosher bakeries. The Maimonides Hebrew Day School offers quality education from nursery through high school. In August, the Lake George Minyan has 50-200 participants at daily morning and evening services. Saratoga Chabad conducts Jewish art and music events and Torah classes year round, and its resident scribe is presently writing acommunal Torah scroll. It also sponsors the Pirkei Avot Library with over 500 volumes of commentaries on Ethics of our Fathers, traditional summer reading. Saratoga's Bais Mashe Shul is a short walk from Broadway's major hotels. The Price Chopper supermarkets offer a year round Kosher store in Colonie, 2 miles west of Northway exit 2w in Albany. During the summer it also has an expanded Kosher section in the Town of Catskill, and in Lake George at Amherst and Iroquois, right behind the main Canada St., plus a Kosher hotdog cart in August.